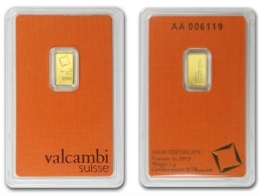 Valcambi Suisse Gold Bar - 2.5g Fine Gold 999.9. Each bar comes individually sealed in a certicard. The front of the bar features the Valcambi logo, with the bar's weight, fineness and serial number below. The reverse of the bar features the words 'Valcambi Suisse'. The certicard encapsulates the bar, protecting it from damage. At the base of the certicard the bar's serial number is also printed. 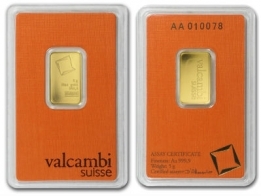 The Valcambi minted gold bar series is the most popular series available from Valcambi. These bars are available in sizes ranging from 1 gram to 1 kilo. 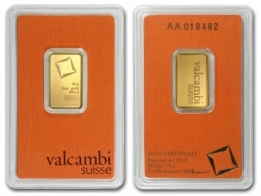 Valcambi also manufacture all the gold bars for Credit Suisse, one of Switzerland's largest banks. 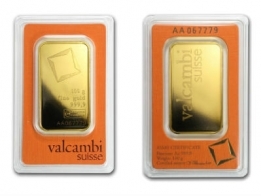 Valcambi gold bars are available in both minted and cast forms, and combibars are also available. Please contact us to sell Valcambi gold bars.